It is important for ergonomic dental operators that the declination of viewing and their working distance be considered before purchasing magnification. A basic pd training exercise, kb3, is highly recommend to establish your desired operating conditions. The degree of magnification of optical technologies necessary for each of the dental procedures needs to be established through improvements in the long term effects of outcome accuracy attributed to their use. GEPEC pd is a minimalistic concept that respects human and earth’s resources. The pd approach for systematic health care promotes the least use of Treatment Technology and the least interference of Treatment Technology with Position Technology. At the present time the amount of magnification is seen as an individual preference. Sight acuity is an individual perception. Older practitioners do not have the eye sight of a 26 year old. Even 26 year olds vary in their visual acuity. The optical enhancement chosen shouldn’t interfere with the human-human/human object interface offered by Position Technology that is optimal for the control of the fingers and the focus of the operator’s eyes as they are directed to operating points. GEPEC rates wearable magnification up to a 2.5 magnification as Acceptable. The Leica wearable and mounted microscopes presented here have not been rated but present an improved compatibility with pd Position Technology over other available microscopes. Designs for Vision was the first optical company to offer customizable through the lens magnification and is still the leader in providing products with exceptional acuity and depth of field for dentistry. Participants in the Basic Training will be able to set proper declination and working distances of scopes for pd care following exercises to establish their personal reference body condition and positions in relationship to oral tissues of a patient. It is paramount that the scopes are set for these conditions facilitated by Acceptable Position Technology to prevent forward head positions, slouching, and extension of forearms that lead to added tension on the spine and shoulder girdle. A proprioceptively derived body reference condition for magnification aids is best acquired and measured during a GEPEC certified workshop. 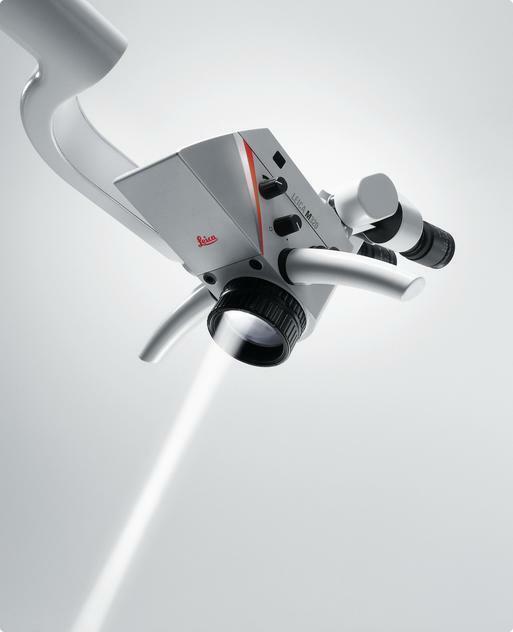 The Leica HM500 is the first head mounted microscope designed for clinical dentistry. It will focus as close as 300mm (11.8110 inches) that is near the outer limits for pd positioning technology that insures improved clinical safety for patients and dental surgeons. It comes with a stepless zoom from 2.0 to 9.0 adjustable by autofocus/ speed focus/ and manual focus. The Leica HM500 has an integrated 200 W metal halide light source with a built-in orange filter. It also can be equipped with an integrated autofocus camera, MPEG-4 recording device, and a touchscreen monitor for teaching systematic views, finger contacts and procedural paths for advanced pd clinical skill. The Leica M-320 with Ultra Low Binoculars allows dentists, hygienists, and auxiliary personnel to operate with an upright spine and a balanced head. It has been the use of the microscope that has synergized the movement of the dental operator to work behind the patient’s head as referenced by GEPEC instead of operating from the 9 o’clock position. The GEPEC pd approved Positioning Technology for dental treatment helps prevent strain on the bodies of dental operators facilitating a higher degree of control for their fingers in the mouths of patients. The addition of the Ultra Low Binoculars to the Leica M-320 maintains the heart level working height of the dental operator recommended by GEPEC Acceptable Position Technology. As seen in the photos below, the working height and working distance with and without the microscope is the same. In addition, the Leica M-320 objective lens distance to operating point allows sufficient working room for instrumentation while maintaining pd patient and dental care provider positioning.